Yoga originated in India. In Sanskrit, the word means to unite. Everyone is most welcome to practice with us. Age, shape and background do not matter. Our team of teachers reflects this philosophy as well. Some are locals, some are from abroad… but we all share the love for yoga! Come and discover. We teach in English and/or Bahasa Indonesia, depending on the yogi language flow. So with every yoga class you take with us, you are not just helping yourself reaching balance. In turn you are giving positive power back to the locals. I was born and raised in East-Java, Indonesia and have been living in Gent, Belgium since 2005. I teach Hatha, Yin Yoga and Yoga Nidra. Yoga came to me right on time, when I needed it the most. I see it as a great gift that yoga came into my life and I am very grateful for that. The connection with nature, space, fun and being with myself and with others is exactly what I want to achieve and give with yoga. Yoga has also brought me back to my roots and this time I want to support all the yoga practitioners around me, for as long as I can. I am a certified teacher in Hatha Yoga and Yoga Nidra (Yoga Life in Brussels) and Yin Yoga (5 Elements International School of Yoga & Movement in Krakow, Poland). In addition I completed the Kids Yoga and Family training at the Rainbow Yoga Training in Paris. My yoga journey began more than ten years ago. First it seemed like an enjoyable physical workout, yet there was much more to it and gradually it grew into a mindful practice, till the time was ripe to dive even deeper and to attend a teacher training. The magic was unfolded and it turned out that it was not only yoga that I loved but also teaching others and experiencing the shift to happier lives. I am certified in Hatha and Antastha yoga (www.yogalife.org) and have been teaching mainly in Brussels, Belgium. Often one path leads to another and recently I took up teaching Pilates Mat (www.bodyandflow.com), inspired by the health benefits of this method. My additional passion is dancing, hence I am inspired by the dynamic flow of movements, that turns into a meditation. It is all about letting go, dedicating time to yourself and enjoying the practice. A yoga practitioner, ceramic artist and product designer, Ananta has a passion for sharing yoga by exploring the body and mind to unveil hidden opportunities. Ananta has studied yoga for over 16 years with some great teachers, including Olop Arpipi/Cle Souren of Iyengar Yoga, John Friend/Desiree Rumbaugh/Patrick Creelman/Tara Judelle of Anusara Yoga, David Life/Sharon Gannon of Jivamukti Yoga, Jenny Sauer-Klein/Jason Nemer/Richard B. of AcroYoga, Daniel Aaron of Radiantly Alive. She completed her 200hr YTT from the School of Sacred Arts in Ubud, Bali. 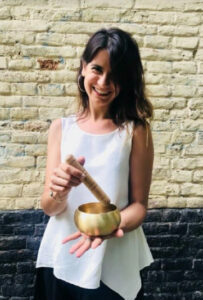 Her teaching style combines a gentle vinyasa (flow) with longer-held postures, deep stretching, body and breath awareness and mindfulness meditation, which can be modified to all levels and needs. I see everyday as a chance to grow and develop my mind and body. As soon as I wake up I practice yoga to keep me grounded and connected. About 5 years ago a good friend of mine introduced me to Yoga, just to help with my Gym recovery. In the beginning… it was a few class of stretching and movement. I soon grew curious and wanted to learn more about the key benefits and the power of Yoga, not only my flexibility improved but so did my muscle tone and Core strength. I also found out Yoga helps with bone health, blood flow and boosts immunity. After a few class I felt rather centered and Zen…sleep became easier too, as the mind becomes decluttered. Since then I have trained in many workshops covering everything from Lower back pain Yoga…Scoliosis Yoga…Acro Yoga and the list is growing. My thurst for knowledge has given me over 200 hours of teaching and I now want to share my passion. In life I don’t let people’s voices discourage me and if I fall, I get up again. I have learnt that nothing is impossible in this world and the sky is the limit. I have been working as a personal trainer and spa therapist in hotels since 1989 and have been a tennis coach for more than 18 years. After suffering some injuries from weight training and really bad injuries from tennis I met a Russian lady called Ms. Eliana, a great yoga teacher. From there it went step by step… I never thought I would be a yoga teacher. I learned from the pain and the steep muscle from weight training. Afterwards I really love stretching and bit of yoga. Along the way and in the course of time I finally made my decision to be a full yoga teacher after joining the TTC at the Markandeya yoga school and since 1997 I have been teaching the knowledge of pranayama. In addition I have mastered crystal healing, cakra healing, prana therapy and acupressure massage. Susan started her yoga journey back in 2013 when she joined her 1st yoga class. Not knowing what to expect she walked out from the class, still feeling uncertain about what Yoga was all about. However, realising that her body was feeling more relaxed. 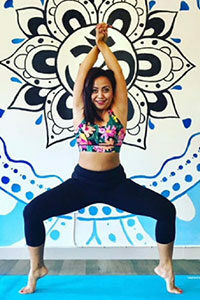 Despite her uncertainty about yoga, she attended more classes until she decided to join the Udana Bali Yoga Academy and completed her 200hours RYS of YogaTeacher Training. From there on she started teaching and built a yoga community among her friends in the Jimbaran area and has been growing since then. Susan believes that the yoga practice is a journey with no end, she keeps exploring further and completed 50hours of Yin Yoga & Trigger Point Therapy. She joined workshops such as Ashtanga Vinyasa, Anti Gravity, Acro Yoga, and Lower Back Pain Therapy. She will always be a student of the practice and deeply grateful for the loving wisdom her teachers have shared with her. In her classes she likes to combine creative sequencing, a spirit of playfulness and a dose of inspiration to help her students deepen their practice. She loves to inspire others to live a healthy life-style, body-mind-soul, to feel refreshed, nourished, and balanced on & off the mat. One beautiful day Ajeng decided to join a Karma yoga class taught by her friends because she had some back pain due to sitting long hours at the office. To heal herself, she continued with Hatha restorative classes until she started practicing regularly and yoga become part of her life. She likes reading about yoga, from anatomy to the philosophy and the mindset of yoga. 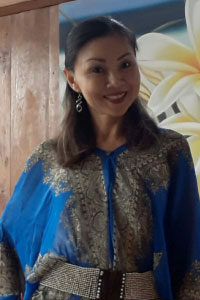 She thinks it is important to keep in mind that: “Living in human form, we are required to walk both ways, out of ourselves to explore the universe and also walk deep into ourselves.” Ajeng is a dedicated yoga practitioner; she is trained in Ashtanga, Restorative Hatha and Yin Yoga as well as Vipassana meditation. Besides teaching yoga, Ajeng is an activist for diversity, gender study and polytheism folkore, being the National Coordinator of the Young Indonesians Activist Forum. Evellyn only started her yoga since she came to Bali a few years ago and it’s been on and off until finally she decided to joined the Udana Yoga School and completed her 200hrs Yoga Teacher Training. Since then her passion for yoga became stronger and she feels teaching is the best way to learn more. To enrich her yoga skills in practice she joined workshops such as Yin Yoga with Nyoman Wahyuni, Lower Back Pain with Putu Dwijendra and Arm Balance with Keith Lee. She is also actively involved in yoga festivals around Bali. She believes yoga is for everyone, different age, shape, sizes and needs. Her main purpose is to encourage people to live a healthy lifestyle from inside and outside. She hopes yoga brings benefit for mind body and soul. Lisa fell in love with yoga in 2010 and has been teaching since 2015 in Balikpapan, Pau (France), Brunei, Darussalam and Bali. She shares Hatha KAPHA, Vinyasa, Restorative and Yin mostly in English and Prenatal Yoga in Indonesian. Lisa’s approach in sharing her Yoga knowledge is based on her own personal experience and her students, as she believes that Yoga instructors learn a lot from the students’ body anatomy and habits. She was blessed to have been guided by Koko Yoga at the Indonesia Yoga School in Jakarta for her 200hours Yoga Teacher Training (as recognised by the Yoga Alliance in Hatha yoga). Since then she has continued to learn and got certified for 50hrs Yin Yoga Teacher Training (Myofascial Release/MFR & Spine Anatomy) by Jo Phee, Prenatal PreTT by Silvia Martha, Kids yoga with special needs PreTT by Mimith Jegeg and Yin & Trigger Point PreTT by Dyonisius Henry. 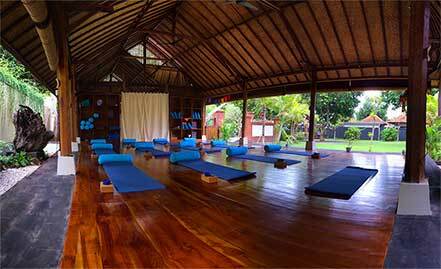 My journey in yoga began in 2003, that was my first time attending a yoga class, Bikram yoga in the South of Jakarta. At that time, I didn’t know anything about yoga. But it was like falling in love at first sight. Gradually I felt that this was what I had been looking for. After years of practicing yoga, my teacher encouraged me to start teaching yoga and share my knowledge to others and this led to being a certified teacher in Yin yoga (yinyogaworld.com), but also with passion, in Prenatal yoga. I have joined workshops for Myofascial Release Masterclass by James Mattingley at Radiantly Alive. My teaching style combines Yin Yang yoga – bringing together the benefits of passively holding yoga poses with dynamic sequences. I am a midwife in a private practice in Denpasar. And every day I meet with many pregnant women, babies, children and sometimes with mothers giving birth. When giving services to pregnant women, I often find pregnant mothers experiencing physical problems that they face during pregnancy. Some are mild and some are heavy. Likewise, many mothers I met experienced problems during labor, one of them was the length of labor. At that time the only thing I could give was limited to light science when on campus. One day I found a yoga training for pregnant women held by Yoga Leaf, that’s where I found a solution that I could give to mothers undergoing the process of pregnancy until labor. From there my desire to learn more about yoga led me to doing TTC 50 hours at Markandeya Yoga, TTC 100 hours at Markandeya Yoga and Yoga Kids from Yoga Leaf. I believe that doing activities with good posture through yoga, will be very helpful for the mother to start from the physical and psychological potential to be a parent. My name is Laura and my yoga journey started almost 8 years ago, when I turned my life upside down. Not only geographically, but also physically and mentally. I quit my long-term financial corporate career as a Communication Specialist in Estonia, moved to the other side of the world to Australia, started traveling and all of a sudden I started practicing yoga and found myself quite often in some of the inversion poses. Everything was upside down and better than ever! I finally started to learn life and discovered the human mind and body, that I had never even thought about. Yoga and I fell in love in my first stretch and we’ve been in a beautiful relationship ever since! A day without yoga and learning is a day wasted, but c’mon let’s be honest here – it happens sometimes! I’ve also lived in New Zealand and since 2016 I’ve been living in Bali, which I consider as my second home island, where I have a privilege to teach yoga and run yoga retreats. I teach mainly vinyasa flow with some advanced poses like headstand and handstand. I also teach yin yoga which is my all time favourite style, practice and teaching wise. I’m a life-long learner, traveller, modern gypsy who likes to serve people and make their world in their own bodies a better place to exist. I love to spread the knowledge about conscious living and how to think and live out of the box. My yoga journey first began by using the discipline to stretch after a long run or workout. However, it quickly became more than that for me as I started to feel a profound sense of inner peace and calm after every class. My decision to follow a teacher training course came more from a passion to deepen my yoga practice than a desire to teach. But when I came to teach my first class I realised that I had found something that had been missing in my life, and that my passion also lay in having the opportunity to give to others by sharing my knowledge and being of service. Moving on my mat gets me out of my head and into my body, allowing me to connect to my soul. That is what yoga is for me – balance between the mind, body and soul. I teach Hatha yoga and Vinyasa flow and I am really excited to further my yoga journey through teaching, learning from others, and taking part in workshops that will deepen and expand my yoga practice and my personal growth. I am currently based in Brussels, Belgium. 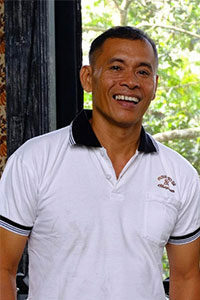 Wayan Viqtim loves to share Ashtanga Vinyasa, Hatha and Fly High for therapy and deepening the asanas. 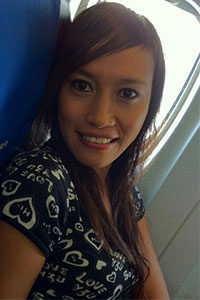 During her work in a hospital, Wayan Viqtim served and physically carried patients so she felt exhausted after work. She began to continuously practice yoga to manage her exhaustion and mental emotion. Taking good benefits from yoga in managing emotions, she enrolled her first yoga teacher training in 2016. 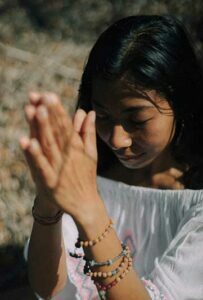 Besides teaching yoga, Viqtim has studied and practiced traditional Balinese dance and makes yoga jewelry (sacred mandala jewelry) like mala’s, bracelets and jewelry making as part of meditation practice. I was born on the island of Komodo, Indonesia.  After graduating from school I came to Bali to look for experience and at this moment I am very happy to be able to join The Yoga Rescue, in Jimbaran. Because the more communication opportunities I get, the more experience I get. I feel happy when I help and when I can serve others when needed.